Doesn’t look like there will be any new collective bargaining agreement between the city and the firefighters this year. Houston’s firefighters union declared an impasse with the city over a new labor contract, which a union negotiator called a “slap in the face” on Thursday. 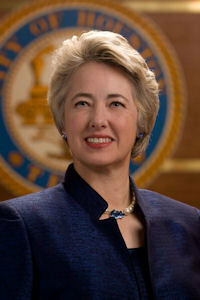 The deadlock comes less than a month after Mayor Annise Parker announced the union was coming back to the bargaining table despite overwhelmingly defeating the city’s last proposal. “So now I’m looking at a 3 percent offer that reduces the cap on holidays, reduces the cap on vacations and I’m not supposed to take that, or have these members take that, as, in essence, a slap in the face,” union negotiator Michelle Bohreer said. The city has looked to scale back overtime costs, which earlier this year almost drove the department over budget. During the budget crisis, HFD had to pull ambulances and engines from duty some days to keep costs down. A March contract temporarily resolved that problem, with firefighters agreeing to give up some freedom to take time off in exchange for a 2 percent raise and a $975 lump-sum payment. Those scheduling restrictions expired at the end of June. See here, here, here, and here for the background; Mayor Parker’s statement is here. The city has a legitimate interest in managing vacation time and overtime pay, as any private sector business would have. By the same token, I understand why the firefighters would be reluctant to give up something that they now have. Given the current budget situation and the overwhelming rejection of the first agreement, I have no idea how much room there is to negotiate at this point. The one thing I am sure of is that all this will be a prominent feature in the 2015 Mayoral race. It will be very interesting to see which candidates stake out which positions. Don’t expect much at this point. Negotiators for the city of Houston and its firefighters union will return to the bargaining table to discuss a new labor contract weeks after union members soundly defeated the last proposed deal, Mayor Annise Parker announced Wednesday. The mayor and Houston Professional Fire Fighters Association Local 341 president Bryan Sky-Eagle had said after the vote – which saw 93 percent of members opposed – that both sides were open to more talks, but it’s unclear whether a deal acceptable to the union can be reached. In other words, officials have said, the council amended Parker’s proposed budget to add a series of spending items that “spent the raise” that had been set aside to accommodate the proposed contract. The rejected deal would have given firefighters a 4 percent raise beginning Jan. 1 in exchange for restrictions on when they could take time off. See here and here for the background, and here for the city’s press release. The most likely outcome at this point is that the firefighters will continue under the current agreement, which provides no raises but also puts no restrictions on who can take vacation when, until 2016, when the firefighters hope there is a Mayor they believe to be friendlier to their interests in office. It’ll be interesting to see who positions himself or herself as their champion in the race. Houston Politics has more. Houston firefighters would give up some of their ability to schedule time off in return for a pay hike under a tentative new labor contract that city officials hope will enable them to rein in overtime costs that threatened to bust the fire department’s budget this year. The City Council and the membership of Houston Professional Fire Fighters Association Local 341 must ratify the agreement for it to take effect as planned on July 1. The agreement, which includes a 4 percent raise, comes on the heels of a budget crisis that has seen the department, on some days, pull ambulances and fire trucks from the streets in recent months to control a spike in overtime costs. Firefighters would get the 4 percent raise beginning Jan. 1, 2015, along with new terms encouraging them not to miss work, which often creates the need for shifts to be filled on short notice by replacements on overtime pay. The deal would run through the end of 2016, though negotiations could reopen in February 2016 on pay and some scheduling items. The idea behind that option, City Attorney David Feldman said, is to see whether voters amend a decade-old cap on city revenue that Parker has said will force layoffs next year if left unaltered. The deal would last only 30 months because of these uncertainties, Parker said. Fire union President Bryan Sky-Eagle said the raise is not what firefighters deserve, but he said the union acknowledges a need to work with the city given its revenue limitations. The contract, Sky-Eagle added, also allows for more flexible scheduling, improves a voucher program by which firefighters buy uniforms and equipment, and secures city promises not to hand its emergency medical service over to private firms or to replace the firefighters running it with civilians. The Mayor’s press release on this is here. Seems like a reasonable deal to me, and if it avoids all the overtime problems, so much the better. Todd Clark, chairman of the Houston fire pension board, opposes the deal. The board and the union are separate, but historically, the union contract has allowed the Houston Firefighters’ Relief and Retirement Fund chairman to be assigned full time to the pension office while drawing a city salary via the fire department. That “special assignment” – at Parker’s insistence, Sky-Eagle and Clark said – has been dropped in the proposal. Deluca said the change means Clark would report to work at a fire station. Clark said he will do so, while doing pension work on his days off – if the agreement passes. Whether one sees this as a brilliant piece of political strategy by the Mayor or a total jerk move likely depends on one’s opinion about the pension issue. The calculation is left as an exercise for the reader. Members of the Houston firefighters’ union have signed off on a deal with Mayor Annise Parker that would prevent pulling firetrucks from service to help balance the Fire Department’s budget. “We’re very pleased that the union membership ratified the agreement,” Houston City Attorney David M. Feldman said in a statement released Friday. Now that the deal has been approved by rank-and-file members of the Houston Professional Fire Fighters Association Local 341, it’s up to Houston City Council members to vote on it. Feldman said they will take it up on Wednesday. See here, here, and here for the background. I can’t imagine any scenario in which Council fails to approve this.